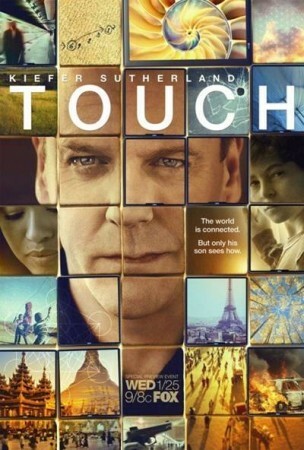 Did you watch the second episode of Touch tonight with Kiefer Sutherland? If you missed any of the show, you can read the full recap HERE. I thought it was heart wrenching when social worker Clea took Jake from his dad again, didn’t you? I love how Martin is such a good father to Jake, don’t you find it really shows how much he cares about him? Martin doesn’t ignore his son, he respects his number clues when nobody else does. When Martin put the dog on the truck and he got loose – I almost thought there was going to be a romance between he and the flight attendant, I couldn’t see where this story was going to go, did you? Little did the flight attendant know that chasing the dog would later lead her to her father! Didn’t you feel sorry for the Indian boy when the flight attendant knocked into him and he dropped his father’s ashes? I was definitely all choke up. I love Jake’s sense of humour, when he made the happy face with popcorn it showed me that there is more to him than just numbers. When Clea used Jake’s numbers “5296? to unlock the door when she was looking for him, it surprised her. Give her a few more situations like that and she will be a believer just like Martin. I was really touched by the Indian’s story about his dad, I loved the way the flight attendant came to his aid, didn’t you? When Martin went to the pawn shop I was wondering, how is this going to fit into the story? Looking back now, the pawn shop owner didn’t look that surprised when the robber came in, did he? When Martin followed the owner to the hospital and he called Martin a potential stalker, I was laughing. Don’t you love how they throw a little humour in every now and then? When we switched to Moscow and the middle school magician performed to no applause, except for one, I felt so sorry him, didn’t you? I don’t think it was good that his father lied to him when he asked him if he “hurt” people, but I do love how the father gave the robber a second chance and returned home making his son very happy. When Martin and Jake find Arnie walking towards the bridge, I was so happy that they ran after him and caught him. I loved the way Martin told him that he cared about him and wanted to be his friend. What did you think about this part? When Martin reminded Arnie that he had his daughter Rebecca to live for, I thought how Martin was such a good person, he watches and listens to every clue he sees. When the Rebecca (flight attendant) was at Yankee Stadium with the Indian it was so sad that he could not go inside. Thank goodness the robber opened the gate for him, don’t you think it would have been horrible to travel all that way and not be able to respect his father? Rebecca finally found the dog and started off in another chase to catch him. At the bridge, when Martin hears the dog, he turns and sees Rebecca running after it and she calls out to her dad, Arnie, when she sees him. You can see how all the pieces fell into place right at this moment. I absolutely love how this show, it gives closure to each episode. In the beginning and half way through, I am crying, laughing, scared and sometimes shocked. How did you feel? In the end, all the stories join together and form a circle of heartfelt happiness. I hope they continue to make future episodes as good as this one, don’t you?